China’s high population density is renowned, as are some of the concomitant problems it brings, such as pollution. So Shanghai Houtan Park is something of an unusually quiet and serene spot, especially given that one of the reasons for its construction on a former brown field industrial site was to cope with the multitude of visitors passing through the locale, drawn by the World Expo. Built on the banks of the Huangpo River, overlooking the bustling city on the other side of the water, it will subsequently have a life of its own as a public green space. The park, which was recently announced as the winner of a prestigious award for a completed landscape project at the World Architecture Festival 2010 in Barcelona, was designed by the Chinese practice Turenscape. 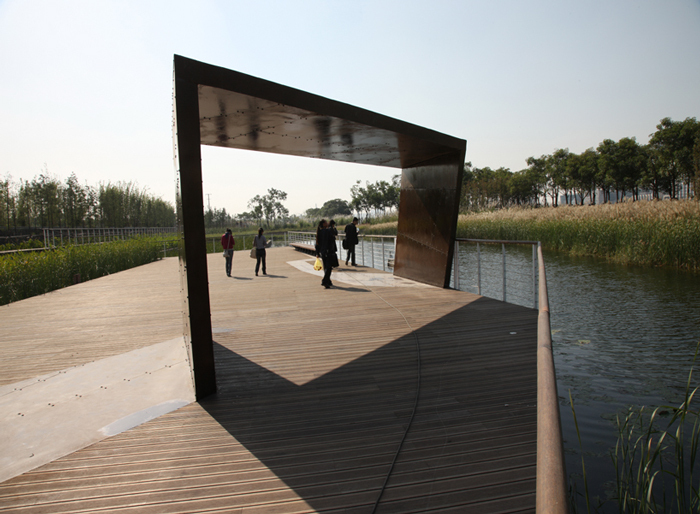 The rationale behind the design and its particular planting was to implement a park that would actually reduce the pollution in the waters of the Huangpo. In effect, the park is a gigantic living machine that is able to cleanse the water, making it safe for a number of uses that would not otherwise be advised, at a massively reduced cost compared with more industrialised processes. With typical Chinese pragmatism, the park is not only a leisure facility with ecologically friendly outcomes, it also houses facilities for food production, creates habitats for wildlife and hosts an educational programme. 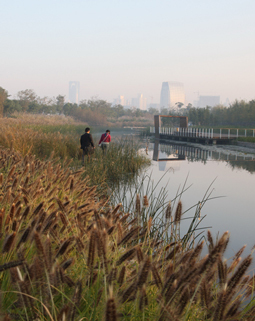 Inspired by the traditional Chinese agricultural landscape, the ancient terraced wet rice fields, the park consists of a system of terraces that rise up from the water’s edge, each providing a suitable environment for wetland plants and enabling the urban population to take on a bit of city farming. But, it is not without an aesthetic component. In addition to the stark architectural language deploying a system of elegant walkways, the simple low-maintenance planting system has been specifically designed to highlight seasonal change, providing a reason for the public to return frequently and watch nature go through its various seasonal cycles. As the judges at the WAF have pointed out, the approach is one that could be readily adopted elsewhere in the world as a means of addressing local water pollution near urban centres. It’s simple and cost-effective approach to urban landscape management has the potential to turn parks from something that leaves an environmental footprint into something that helps erase them.